At International Home Interiors, we have an extensive inventory of home furnishings and décor that will fit any style or budget. Whether you are looking for one specific item or want to entirely redecorate your home, we are able to accommodate you. 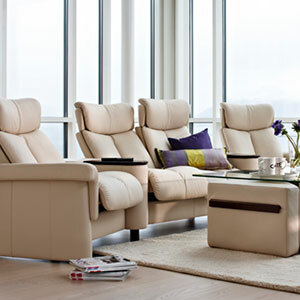 For over forty years, we have been helping customers find beautiful discount furniture in Kitchener, ON. Our priority is customer satisfaction. We believe your home should reflect your style and be a place of beauty and comfort and so our showroom sales representatives will go to great lengths to be sure our customers find exactly what they are searching for. Living room furniture: From beautiful sofas, loveseats and recliners, we have quality living room furnishings to fit any interior design. Bedroom furniture: Your bedroom should be a place of style and comfort. At International Home Interiors, we carry bedroom sets in a variety of styles, at a great range of prices. Dining room furnishings: We offer gorgeous dining room furnishings from name brands at affordable prices. Mattresses: At International Home Interiors, we understand that people’s preferences with regard to mattress comfort vary considerably. Therefore, we carry a wide variety of styles, sizes and levels of firmness. Whether you’re someone who likes a soft, pillow-top mattress or a firmer style, we have the perfect mattress for you. At International Home Interiors, we carry a wide variety of affordable home furniture and décor of all styles. Our showroom representatives will assist you in choosing the best furnishing to fit your interior design. Come visit us or call us at 519-742-8501 and find out why we’re Canada’s most trusted furniture retailer for every room of your home.